1. Don’t tell anyone but I’m not really a doctor. I just pretend. Just like all them other TV show hosts. It’s all fake! 2. I mean it! TV shows are fake. Once Handy Harry himself (of Go Go Garden TV) visited me to plant a tree. But he only moved a handful of soil! Normal gardners do all the actual work! 3. At least I’m not a con. My name is really Doctor Bird. I got it just because some people in the past thought us Doctor Birds have true healing powers. Now everyone believes that. 4. Real doctor or not, my nickname provides me with a job good enough to take my tea with flavored sugar! Oh - here comes my assistant, possibly with a patient. Lights, camera, action! 1. Aha! The patient’s a cow. My favorite animal. I’m good at cows. She says her utter’s itching. Hm, let me see... hm... yes... all right. This’ll be done in a sec. Hold on. 2. Pst farmer. Get me a bottle of anything. This cow just needs to be milked but for show’s sake I’ll make it a bit more interesting. All for my viewers and advertisers. 4. Look farmer! Her milk is pink cause... it’s strawberry milk! 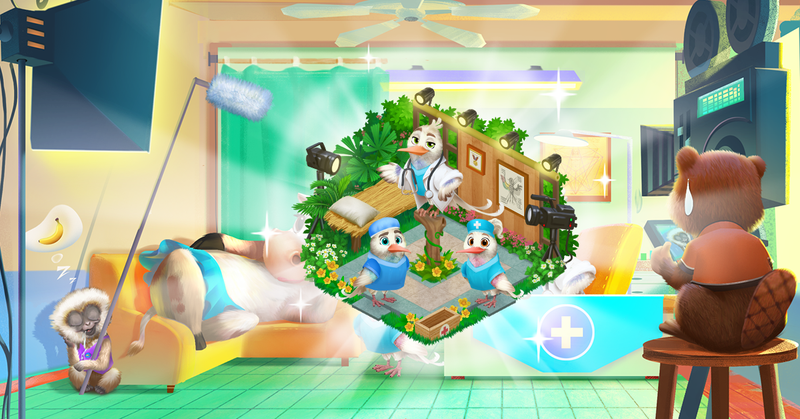 Yes dear viewers, that’s the magic of Doctor Bird! Now after the break you’ll meet my next patient: a boy named Darryl! 3. Whoa! I can’t believe this. Darryl’s jumping around like a happy kangaroo! Do we have this on camera? This will surely bring me a TV award! With a cheque and flowers! 4. Wait... I didn’t cure Darryl. YOU did - I am merely a pretender. YOU deserve the rewards! Sigh. I’m done pretending. I’ll apologize to all your friends and retire on your farm. Page generation time 0.0422 sek.